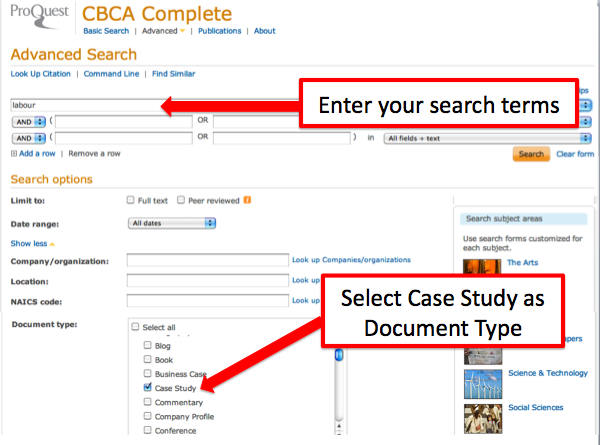 CBCA Complete offers similar ways of finding case studies: enter your search terms, then either check off the Document Type Case study or include the Subject Case studies as part of your search. 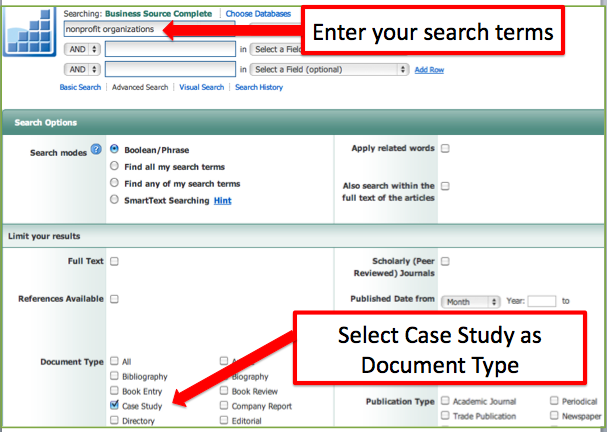 Business Insights: Global provides access to case studies drawn from a variety of sources. From the website: "The Journal of Business Case Studies (JBCS) welcomes case studies designed for use in business and economics courses and articles related to the use of case studies in the classroom." An open access journal. From the website: "The Acadia Institute of Case Studies (AICS) is a non-profit centre in the School of Business Administration, Acadia University. The purpose of the Institute is to develop educational resource materials to assist educators and instructors in the classroom by providing innovative and enhanced "teaching tools" which reflect "real-world" situations." "Ideas Worth Teaching is a tightly curated, weekly email for business school faculty to prompt new conversations in the classroom about the relationships between corporations, capital markets, and the public good. Its intent is to provide “drag and drop” functionality – allowing faculty to easily use the articles, cases and other teaching materials that we will be sharing in their class discussins." As part of The Case Centre’s commitment to promoting the case method and supporting case teachers, we offer a growing range of free cases produced by a number of prominent schools and organisations across the globe. Note: registration is required to access these case studies. The teaching business case studies available on LearningEdge, which fall under the headings of entrepreneurship, leadership/ethics, operations management, strategy, sustainability, and system dynamics, are narratives that facilitate class discussion about a particular business or management issue. Schroeder and Schroeder provide case studies related to the work they have done for various clients. Updated annually, the Times 100 presents actual business issues from real world companies. Looks at the impact of various economic policies on three different groups: People, Business and Government.